Oh Kitchn, how I love thee! I read this idea on The Kitchn blog a few weeks ago and have been meaning to comment on it for awhile. It's pure genius! 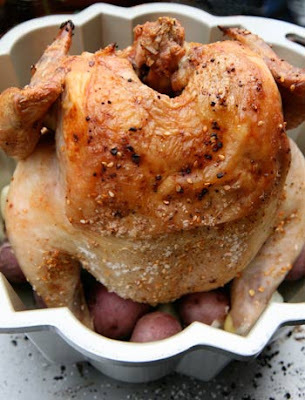 Instead of roasting a chicken on a vertical roaster, why not try using a bundt pan! You're probably more likely to have a bundt pan in your kitchen anyway, plus, the bundt pan lends itself perfectly to cooking a chicken because you can also cook a bunch of vegetables in the bottom and let the bird rest on them. So it's an all-in-one meal. Go ahead, try the recipe The Kitchn posted for roasting a chicken on a bundt pan. Perhaps you'll start using your bundt pan more often now! I saw this recipe in The Kitchn as well and used it twice with great results. Quick and easy, both preparation and clean up. We eat a lot of roasted chicken so this is perfect for us and oh! that skin! So good yet soooo bad! Seems like a great way to get a baker who rarely cooks to cook! ;-) Well, I think it will be a lot of fun to try it! I love chicken made on a vertical roaster so I can't wait to see how this comes out!